You know that familiar childlike song that would fill the neighborhood on a warm summer’s day? The sound that meant it was ice cream time? The ice cream man is the original food truck: a standalone vehicle that also sells food. Nowadays, there are many different kinds of food trucks available; however, you usually have to go to them. What exactly is a food truck? A food truck is basically a restaurant on wheels. However, to really be a food truck, it has to be a fully functional vehicle. Trailers don’t count. The exterior of the truck is painted to attract attention and there are small windows to order from. The interior of the truck is a full kitchen, complete with fryers, grill tops, freezers, and any other applicable equipment. 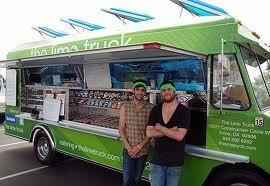 Food trucks have a fun vibe to them and are a very convenient way to get delicious, high-quality food. What kind of food can I get from a food truck? These days, most food trucks have a specific kind of food that they specialize in. For example, in Houston you can find burger trucks, taco trucks, and even cupcake trucks. The food is usually decently priced and surprisingly scrumptious. People who own food trucks are passionate about the food they serve and it shows. If you live in Houston, you are in luck because The Chron recently reported that Houston is home to four of the best food trucks in the nation. The top spot for Houston goes to Bernie’s Burger Bus, which specializes in all natural burgers made completely from scratch. Where can I find food trucks? Unfortunately, you probably won’t see a taco food truck going up and down your street playing mariachi music to draw you in. Instead, you have to track them down. You can usually find them anywhere large crowds gather, such as carnivals, sporting events, and even large office buildings. Roaming Hunger is a great resource that tells you all about the different food trucks in your area and where they can be found. Plus, on the first Friday of every month the biggest food trucks in Houston gather on Crawford Street for a food truck extravaganza. So put it on your calendar and prepare to get your grub on.